Thank you for coming to my Resume Website. I love helping people and I love coming up with creative solutions. 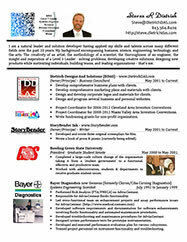 I have a dynamic combination of Business, Creative, Technical, Analytical, and Interpersonal skills. 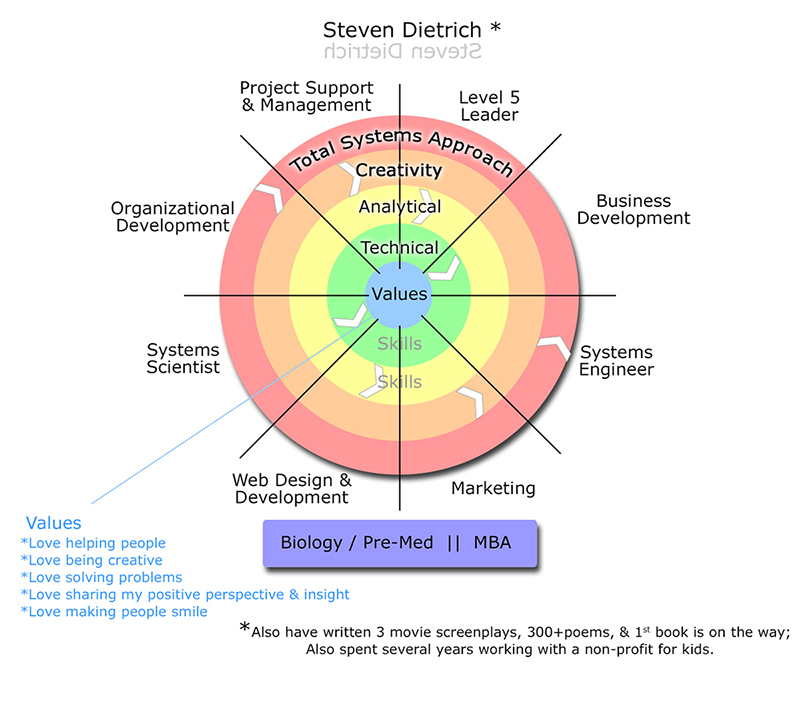 I am a Level 5 Leader (w/MBA) that takes a Total Systems Approach to Develop Creative Long-Term Solutions and Build Teams. Small Business and Non-Profit Consultant - Marketing, OD, Business Strategist & Analyst; Systems Engineering Scientist, Director of Technology, Website Developer, Writer, and Project Manager - That's me, plus more. With my MBA and 25 years of diverse business, science, technical, engineering, and project management experience I bring a lot of skills and insight to any team and project. I love helping people and I love figuring out problems and developing creative long-term solutions. With my leadership style and positive psychology experience I do things the right way and make a significant positive difference. I know that I can make a significant positive impact on your organization and that with me you are hiring for the future. One of my core competencies is integrating cross-functional areas. If you look at my experience as a Systems Engineering Scientist at Bayer you can see that I developed my Total Systems Approach from the beginning of my first career. Having a science and engineering background and completing the pre-med program helped me develop many skills and competencies which I have used in my consulting business. For almost 15 years, I have been a hands-on small business and non-profit consultant doing everything from Marketing and Advertising, to Project Management, to Website Design and Development, to Organizational and Business Development. 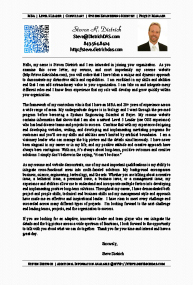 Here is my current 2015 Resume and Cover Letter. But what's most important is not any individual thing, but the combination of all of these things. Project Management and Support. I've led many cross-functional teams throughout my career. Effectively communicating and motivating others toward a common goal have been two of the keys to my success as a project manager. Change management. I love working with teams to develop and implement new programs that lead to long-term positive organizational development. Developing new programs and procedures to help create a better future for everyone. Dietrich Designs And Solutions - we do almost everything. Marketing, Advertisting, Organizational Development, Project Management and Suppport, Business Strategy and Development. I love bringing my experience and insight to new clients to help them succeed. Balancing the big picture with the details, the short-term crisis with the long-term impact. Integrating business with technology, marketing with engineering, research and development with manufacturing. Being able to look at the market and see opportunities. Understanding what is and creating a Vision of what can be. A Level 5 Leader is a person who focuses on the team, on the project, not on their potential gains from taking on a leadership role. Someone who puts the project, the team, before themselves. These types of leaders produce the best results not only in terms of output, but in terms of team performance and employee job satisfaction. Positive Psychology is a passion of mine. Helping people to be happy and to flourish and to see things in a different life is the most rewarding work I do. My positive attitude is contagious and I'm always looking focusing on solutions, not problems, because what is most important is not what happens to us but how we deal with it. Can Creativity and Intuition be taught? Creativity can be your greatest resource. You must hire and nurture every talented and creative person you can find. Creatives will drive your business. They will see things that others can't, and create solutions when things seem impossible. This is an organizations most valuable asset. Working with Research and Development, Manufacturing, Field Service. Effectively communicating with Scientists, Mechanical, Electrical, Software, Industrial Engineering to Design, Evaluate, and Develop the Advia:Centaur at Bayer. I completed the Risk Analysis (FTA/FMECA) on the blood analyzer for the FDA. Fully Customized Responsive Websites. For many of my clients I develop WordPress websites and train them how to update and maintain them. For some it's fully customized, programmed HTML5/CSS3 websites with SEO. How I work is just as important as what I do.